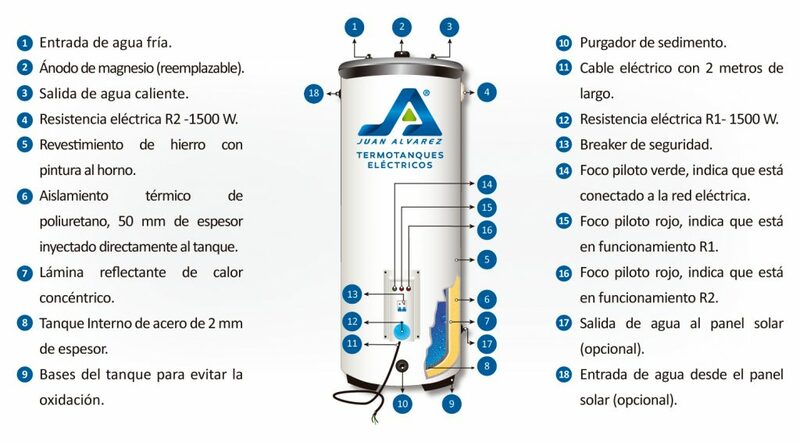 Our electric hot water storage tanks, according to the model chosen, accumulate a certain amount of water which is heated according to the temperature set by the owner/operator in homes, hotels and industry. 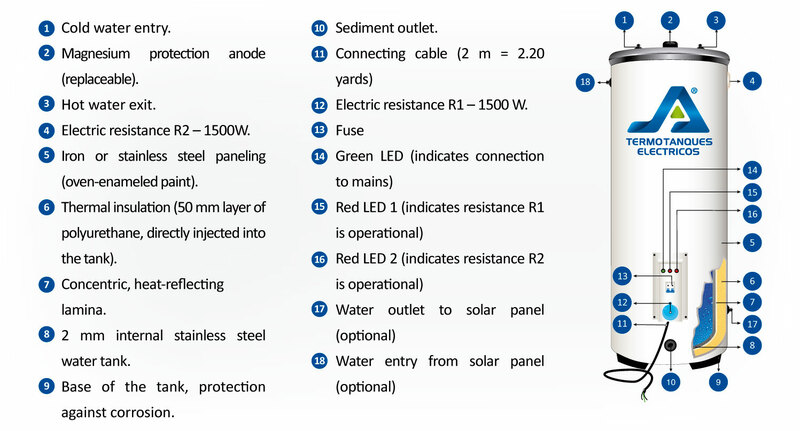 The tank works with electrical resistances which have their own independent temperature control. Its double thermal insulation maintains the water temperature inside the tank for extended periods of time. Energy consumption is therefore kept at a minimum, providing a highly efficient solution. HOW DOES A HOT WATER STORAGE TANK J.A. WORK? In order to understand how a hot water tank works, first we need to know the difference between a flow-type heater and a storage heater. On the one hand, flow-type heaters do not need to store water since heating is immediate, resulting in high energy consumption. The calefon a gas, electric showers and wall heaters are some examples of flow-type heaters. On the other hand, storage water heaters consume less energy; hot water tanks and solar-thermal panels fall into this group. They accumulate a certain amount of water which is heated. Naturally, this takes longer but once full, they provide hot water (60°C or 140°F) to different points of consumption around the house such as showers and sinks. This type of heater is predominantly used in hotels and in industry, but can also be used in homes. IN ORDER TO INSTALL A HOT WATER STORAGE TANK J.A. DO I NEED TO CHANGE MODIFY MY WATER FACILITIES OPERATING WITH A CALEFON A GAS? MAY I PUT THE HOT WATER STORAGE TANK J.A. INSIDE MY HOUSE OR APARTMENT? Yes, of course. You only need to connect the cold water entry point of your water storage tank JA to any cold water outlet and connect the tank’s hot water outlet to the hot water installation point in your house or apartment. It is, however, recommended that you install the tank where there is a drain such as the laundry room or a terrace since the tank has an overflow valve which may open in case of excess pressure. Both locations may also facilitate access in case of future maintenance work. IS THERE ANY DANGER OF INHALING TOXIC GASES? No. The tanks are 100 percent electric (optional: solar-powered). The only potential risk may come from loose cable connections or the use of a cable of the incorrect diameter, causing the cable to heat up. For this reason, it is recommended that you use the exact cable specified, as well as quality sockets. WHAT IS THE ADEQUATE SIZE OF THE TANK? Based on these numbers, we can do a quick exercise with a 100 liter (26.42 gal) tank. The tanks are programmed to heat water up to 60°C or 140°F. Mixing 140°F water from the tank with cold water renders about 150 liters (about 40 gal) at 37°C (98°F), which is a convenient temperature for taking a shower. 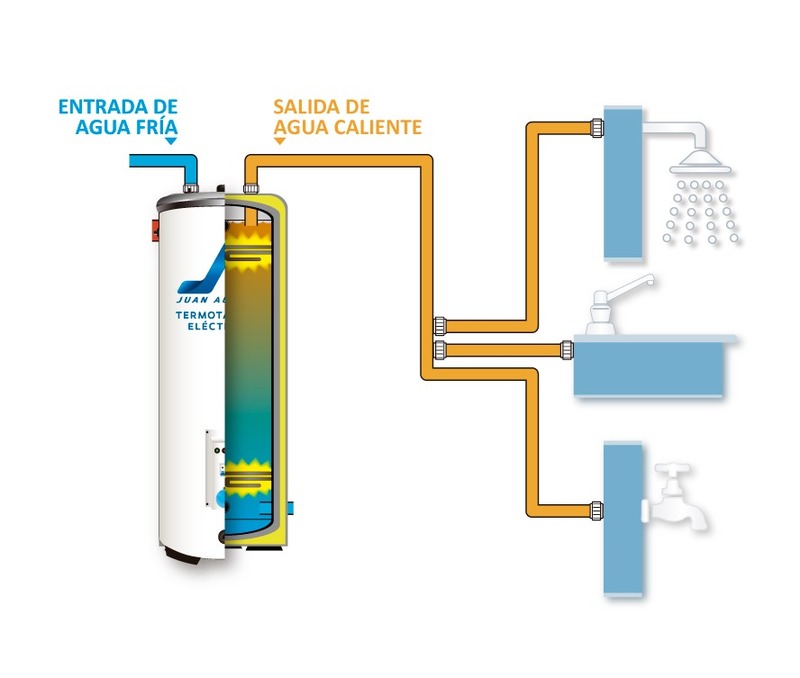 This means that a 100 liter (26.42 gal) tank will provide enough water for two people taking an average length shower at the same time or one after the other. A third person may have to wait 15-20 minutes for the tank to provide enough hot water again. For detailed results of our own laboratory tests, including temperature/consumption diagrams, please refer to our online catalog (available in Spanish), page 21. Note: On the coast, performance tends to be significantly higher since the average temperature of grid water there is around 23°C (73°F), whereas it is about 13°C (55°F) in the highlands. WHAT IS THE MONTHLY ELECTRICITY BILL FOR A FAMILY OF 4? Again, there is no standard answer but it is possible to easily calculate the cost of consumption per hour, depending on the capacity of the tank. Our tanks come in different sizes. Energy consumption, therefore, varies between 1.5, 3.0, 4.5 or 6.0 kW and more. Multiplied by $0.09, the current cost per kWh in Ecuador, this will give us a very precise cost estimate per hour. 3 kW * $0.09 = $0.27 per operating hour, to which we have to add taxes and other charges (trash collection, public lighting) commonly levied upon the cost of electricity in this part of Ecuador. 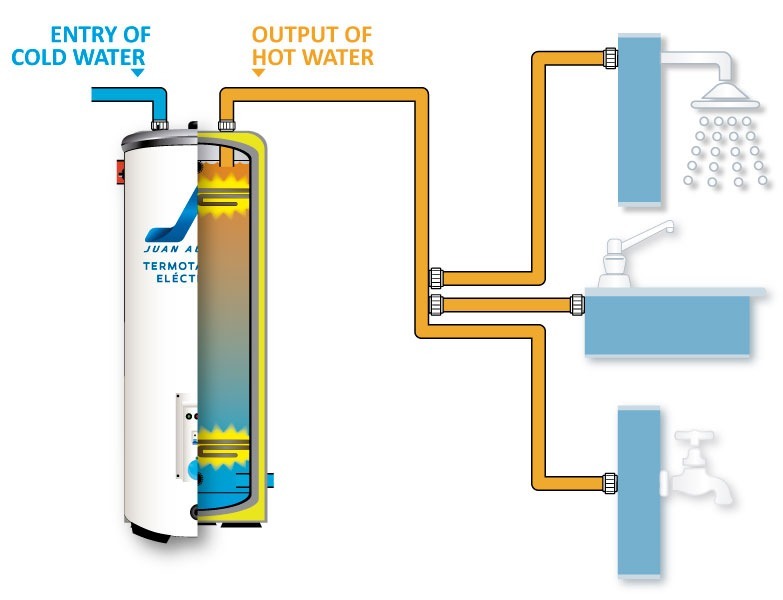 Note: Our hot water storage tanks JA are equipped with an automatic switch on/off feature and an independent temperature control for each resistance. They will therefore remain in “off mode” most of the time. The tank will switch itself on only for about 3.5 minutes every 3.5 hours on the coast and 3.5 minutes every 3 hours in the highlands to maintain the programmed water temperature. 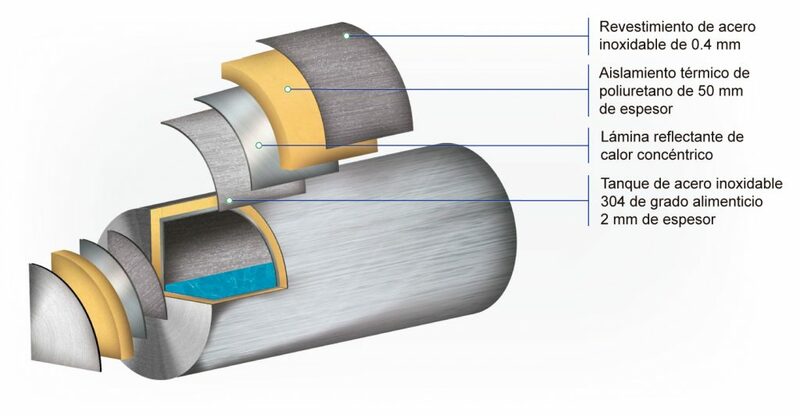 These characteristics, along with the thermic insulation (made of concentric, heat-reflecting lamina and a 50mm layer of polyurethane) render our tanks more efficient and economical with regards to energy consumption. IS IT POSSIBLE FOR SEVERAL PEOPLE TO TAKE A SHOWER AT THE SAME TIME? Yes. As stated before, the tanks are programmed to heat water up to 60°C or 140°F. Mixing 140°F water from the tank with cold water renders about 50% more water depending on the capacity of your tank, which, in turn, should be purchased according to the size of your family/ household. IS THERE ANY ADDITIONAL SAVINGS POTENTIAL? All hot water storage tanks available on the market may be equipped with a timer which you may set according to your needs. More important yet, our tanks may easily be connected to a solar thermal panel JA which reduces energy consumption even further. WHAT IS THE OPERATING LIFE OF HOT WATER STORAGE TANKS J.A.? Given the high-quality materials we use and based on past experience, use of hot water storage tanks JA may easily exceed 15 years. Our tanks come with a 3-year warranty for all structural parts, covering internal water leakages, breaks and defects of the thermal insulation. All electrical and electronic components such as resistance, temperature controls (thermostat), and timers have a one-year warranty.